The Francis Marion Hotel sits across from Marion Square in Charleston’s historic downtown. Guests are just a block away from the King Street shopping district with its boutiques, antiques stores, and restaurants, and can reach Charleston Harbor on foot in 15 minutes. King Charles Inn is across the street from the premium brand stores of Charleston Place and a 3-minute walk from Charleston City Market, a 200-year-old institution selling local produce. Guests can also stroll down Museum Mile to the Confederate Museum and the South Carolina Historical Society. 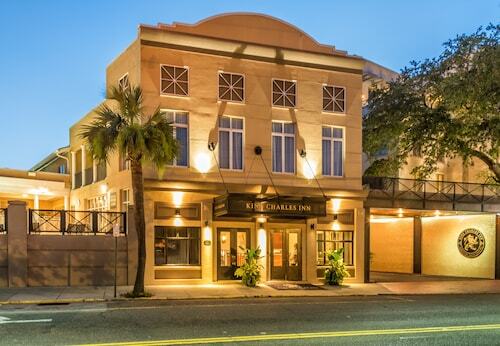 Located in Downtown Charleston, this hotel is within a 10-minute walk of PURE Theatre and Charleston Music Hall. College of Charleston and Medical University of South Carolina are also within 15 minutes. Tides Folly Beach Hotel is right on the Atlantic coast, on a quiet stretch of beachfront 11 miles (18 km) from downtown Charleston. Nearby activities include kayaking, fishing, and paddleboarding, while USS Yorktown and Fort Sumter Civil War site are a half-hour drive. 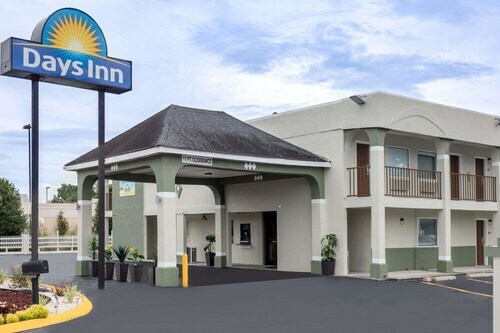 Located in the center of Charleston's historical area, this hotel is across from the City Market, and 5 blocks from Waterfront Park. 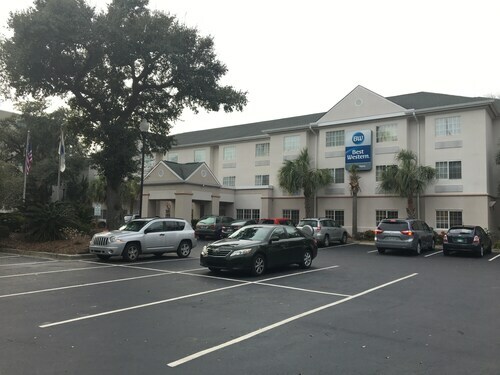 Situated in Mount Pleasant, this hotel is within 1 mi (2 km) of Mount Pleasant Memorial Waterfront Park and Shem Creek Park. USS Yorktown and The Citadel are also within 6 mi (10 km). 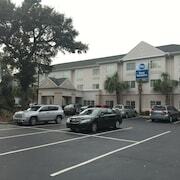 Situated in Charleston, this motel is 0.5 mi (0.9 km) from Citadel Mall and within 6 mi (10 km) of Medical University of South Carolina and Charles Towne Landing State Historic Site. Charleston City Marina and Joseph P. Riley, Jr. Park are also within 6 mi (10 km). 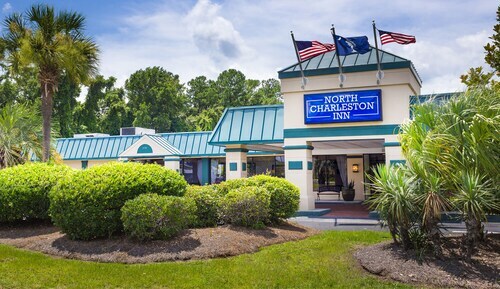 Located in the heart of North Charleston, this hotel is within 1 mi (2 km) of Charleston Area Convention Center, North Charleston Coliseum and Performing Arts Center, and Charleston Tanger Outlets. CSU Medical Center and United States Air Force Charleston Air Force Base are also within 6 mi (10 km). 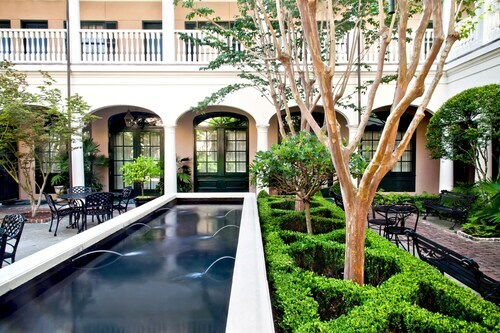 Surrounded by 18th-century buildings in the city’s historic district, Belmond Charleston Place is a block from the antiques stores of King Street. Guests can walk 10 minutes south to Heyward-Washington House, which dates from 1772 and features a collection of Charleston-made furniture. 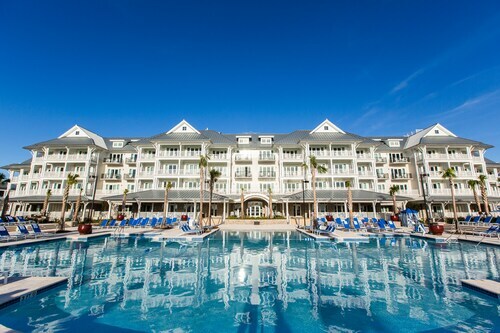 This family-friendly Charleston hotel is located in the historical district, within a 5-minute walk of Port of Charleston Cruise Terminal, Waterfront Park, and Charleston Waterfront Park. Charleston City Market and College of Charleston are also within 1 mi (2 km). Built in 1844, this beautifully restored inn is situated on the historic Charleston City Market's Great Hall; the King Street Antiques District is only a block away and picturesque Rainbow Row is a short stroll away. This family-friendly Mount Pleasant hotel is within a 10-minute walk of USS Yorktown and Patriots Point. Patriots Point Links and Patriots Point Naval and Maritime Museum are also within 10 minutes. 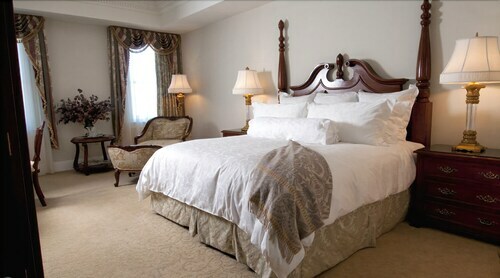 How Much is a Hotel Room in Charleston? 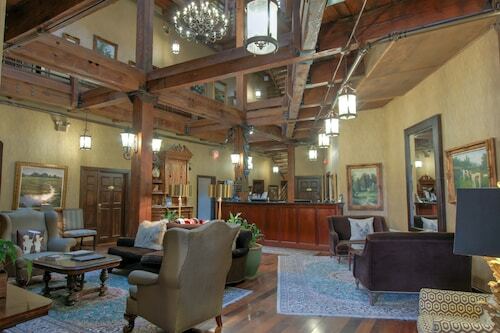 Hotels in Charleston start at $73 per night. Prices and availability subject to change. Additional terms may apply. There are few places in the world that, no matter how much they change and grow, always welcome you back like an old friend. Even if this is your first time traveling to Charleston, the comforting cornucopia of zesty South Carolina barbecue and savory shrimp and grits will make you feel like a local…one bite at a time. Like a long-lost cousin, share in the memories of a city seemingly set back in time, where things move a bit more slowly, parks and gardens are a stately affair, and the streets seem to breathe history as the timeless tide laps against the shore. Whether you’re eager to taste the latest craft gose—a tart, herby beer—or settle in for an evening of captivating performing arts, book hotels in Charleston and make yourself at home. 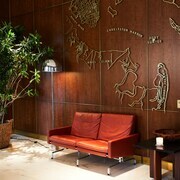 The Francis Marion Hotel: For the artistically inclined, The Francis Marion is a must-stay. Located at the corner of King and Calhoun, this vintage accommodation offers lovely views of Marion Square to the east and any suite is within walking distance to major museums and delightful dining. Whether you want to sit in awe of the latest installment at The Halsey Institute of Contemporary Art or browse local galleries, all you have to do is tie your shoes and turn the corner. A little night music is in order. 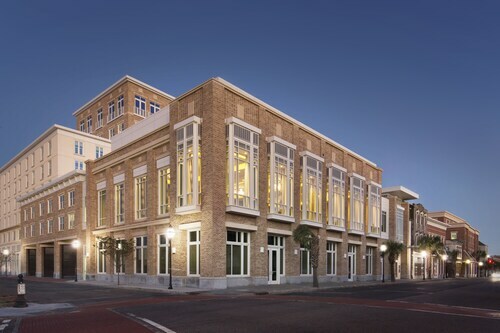 Take advantage of the proximity to the Charleston Music Hall and enjoy dinner and a concert. Dine out at one of the indie New American bistros nearby or call room service for some in-suite luxury. Belmond Charleston Place: If you want to see, touch, and taste Charleston’s rich history, then stay at Belmond Charleston Place, a 4.5-star hotel that is undeniably one of the best places to stay in Charleston. You’ll know it’s true as soon as you see the shimmering lobby chandelier. From this location on Meeting Street, walk to the old Charleston City Market, the Confederate Museum, the Old Slave Mart Museum, and Waterfront Park. You could spend hours and hours ambling through the neighborhood, but don’t forget to relax away the busy days with spa treatments and poolside lounging while the hotel’s child care specialists take care of the kiddos. Shop till you nearly drop in the luxury boutiques at Charleston Place, just one block south of the hotel. Love to stay current with theater premieres and award-winning productions? Walk just a few minutes to the Threshold Repertory Theatre and discuss the design elements over a glass of wine at Muse—a local favorite serving up Mediterranean fare and an extensive list of international wines. The Mills House Wyndham Grand Hotel: Business travelers will find all the amenities at The Mills House especially appealing, but don’t think for a second that this downtown oasis is all work and no play. Book one of the conference rooms and utilize the business center for your next professional meet and greet, and leave any sensitive documents in a secure safe while you explore Charleston. Walk just a few blocks to peaceful Waterfront Park, passing Hibernian Hall, Washington Square, and several independent art galleries along the way. Just like a good friend, Charleston is always brewing with new possibilities and fun ideas. 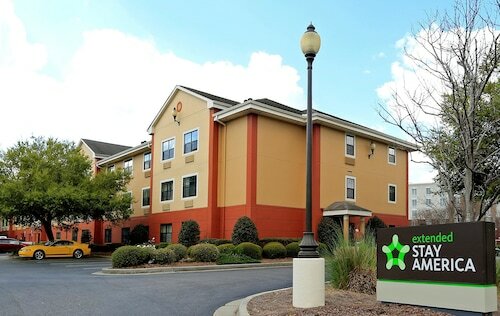 And with Travelocity’s cheap hotels near Charleston, you’ll get a taste of the city’s signature Southern hospitality at the lowest price available. 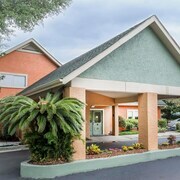 We promise to match any competitor’s deal, so you can rest easy before you even arrive in Palmetto City. Need insider tips on must-see attractions in Charleston? Check out our Charleston travel guide! We liked the older historical building. 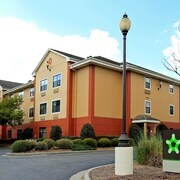 Great staff and easy walking to downtown. We took the bike taxi. I can't say enough about the staff!!!!!!!!!!!! They were very accomidating, friendly and informative.